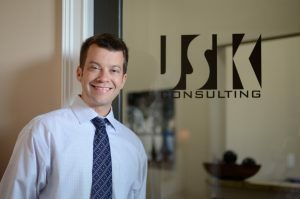 Matthew Johnson, PE is a Founding Partner and President of JSK Consulting. Since 1996, Matthew has provided development support services to public and private clients throughout Central Florida, with an emphasis on Land Development, Roadway, Drainage and Utilities projects. Matthew graduated from Florida Southern College with a Bachelor of Science in Physics and Economics and then moved on to earn a Masters in Civil Engineering from the University of South Florida. Over the last decade Mr. Johnson has been working closely with many local engineers in his field to develop strong personal relationships and is well known for his high level of integrity. His ability to work closely with regulatory agencies and engineering peers is evidenced in his strong working relationships with local governmental departments and impeccable public image. He is responsible for direction and supervision of all engineering, personnel operations including civil engineering; environmental engineering; site planning and analysis; and governmental agency coordination. Matthew represents personal character, integrity and a public image that is beyond reproach by presenting himself to local colleagues within the civil engineering field as an exemplary professional engineer. Mr. Johnson has been an active member of his local church for the last three decades where he participates in activities and groups designed to promote community involvement and Christian beliefs. Together with Kerry Johnson, his wife of twenty three years, Matthew works with a local engineering affiliated group to give college scholarships to well deserved engineering students pursuing degrees in engineering fields. He also serves on the Board of Directors with the Central Florida Development Council to foster and support continuing community involvement by his business and other local engineering businesses in the area.